Your gaming experience will never be the same, it will only get real. ey, guys. In this video review we will go through the maze of the infinite gaming world, but not to worry, we have the best guide gadgets. 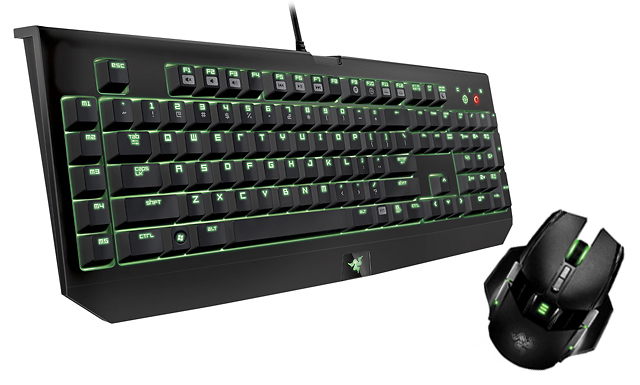 Digital Magnet presents the ultimate gaming set by the world leader in the production of gaming hardware Razer. These are Razer Ouroboros mouse and the Black Widow keyboard. The mouse design is pretty cool and innovative too. The futuristic shape not only creates an effective appearance but is also designed to provide maximum accuracy over the control movements. Ouroboros mouse has two flexible side panels. What is more, the customizable ergonomics make it adjustable to suit all kinds of gaming grip styles and even left-handed users. The enhanced sensor technology features 8 200 dpi and an integrated dpi button which delivers better accuracy and 10 times faster movements in culmination scenes. The best part is that you are not tied to any cables: the 4G dual sensor system allows wireless connection. The laser and the optical sensor accurately calibrate the mouse to any surface so that you get exceptional tracking. The AA battery on board provides cordless freedom of motion for about 12 hours. Beat the enemy with power and control over any situation. Razer call this mouse’s best addition the Black Widow Ultimate 2013 Keyboard. It is what will make your game experience complete. The full-sized keyboard provide all possible multi-media controls including 5 additional dedicated macro keys. You can now record unlimited macros instantly even without taking your eyes off the game. Change between up to 10 profiles immediately, without the irritating roaming into complex driver menus. The Black Widow features a full mechanical key technology which brings a superior and fast response. The reduced actuation distance of only 2mm receives your commands faster than any other standard gaming keyboard. Now you can actually hear the commands your give thanks to the light pronounced tap when your fingers press each key. The 10 key roll-over allows you to actuate as many keys as there are fingers on both your hands. That’s right they keyboard registers and executes up to 10-key commands. There is one USB-passthrough so that you have at your disposal one additional connection port. There is also an audio-out and a microphone-in jacks on the right side of the keyboard case. The braided fibre cable will never get tangled no matter how many cables it runs with. Never miss a key in the dark thanks to the individually backlit keys, the green light creates a full light to navigate accurately even in low light conditions. The black widow keyboard features Razer Synapse 2 that is intuitive software which syncs the keyboard to a cloud server to download driver and firmware updates as well as save individual gamer settings like keybinds and macros. The Black Widow keyboard weigh around 3.31 lbs. And there you go, with this Razer gaming set you are fully equipped for overwhelming destruction of your enemies.